I was impacted pretty hard by the whole Photobucket Shennanigans Thing. However, it wasn't all bad. As I was digging through some of my old albums I ran across some old memories too. 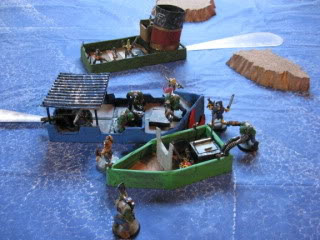 About 5 or 6 years ago, I had made a Gorkamorka mod called Da Deff Islands Skirmish. Instead of being set in the wastelands of Angelis, it was set on an island atoll of a different planet. Here, a Waaagh! was building and Ork scavenger's were sent out to collect scrap to build-up the war machine. Out there, they encountered human criminals and scum tryign to collect the scrap for themselves and sell it to the Imperial authorities for their war machine. Rival gangs were essentially battling for scrap, just like Gorkamorka. However, the big difference was that they were using boats and rafts on water instead of the desert. We used scratchbuilds, Necromunda models, Ork Boyz, Demonblade models, unknown "future scavenger" models, and found materials for our games.